Librarian activities with nurses are based on a research-based needs assessment of nurses’ barriers to evidence-based practice. The poster will describe a few interventions that followed including the librarian’s outreach to the Education, Development, and Research (EDR) department; active participation in the nursing, shared-governance Research Council from its inception; and the use of journal clubs to facilitate reading and understanding the evidence. Providing writing support to assist nurses in getting their research published. Our medical center was recently awarded Magnet accreditation on December 12, 2011, and in that initial accreditation, our medical center was named an exemplar (a model for other Magnet Hospitals) in the “NK4” New Knowledge category. 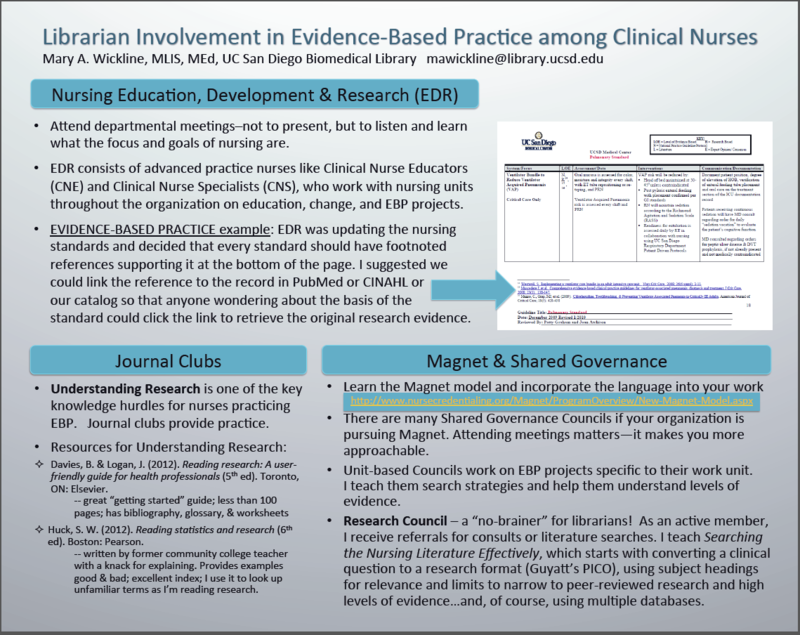 Download and view the full-size PDF of Mary A. Wickline’s poster, Librarian Involvement in Evidence-Based Practice among Clinical Nurses. Poster content is copyrighted by author(s). Contact the poster author(s) if you would like to re-publish or re-use their work. This is a great example of how to really get involved with nursing research. I still have much to learn about the research process but I’d like to try and incorporate some of the things described in this poster. Thanks Mary for sharing you experience.